The Manto de la Novia waterfall is approximately 40 meters high with a single drop.The region of Baños de Agua Santa in the province of Tungurahua (Ecuador) is known, apart from being located on the slopes of an active volcano, for its beautiful waterfalls. 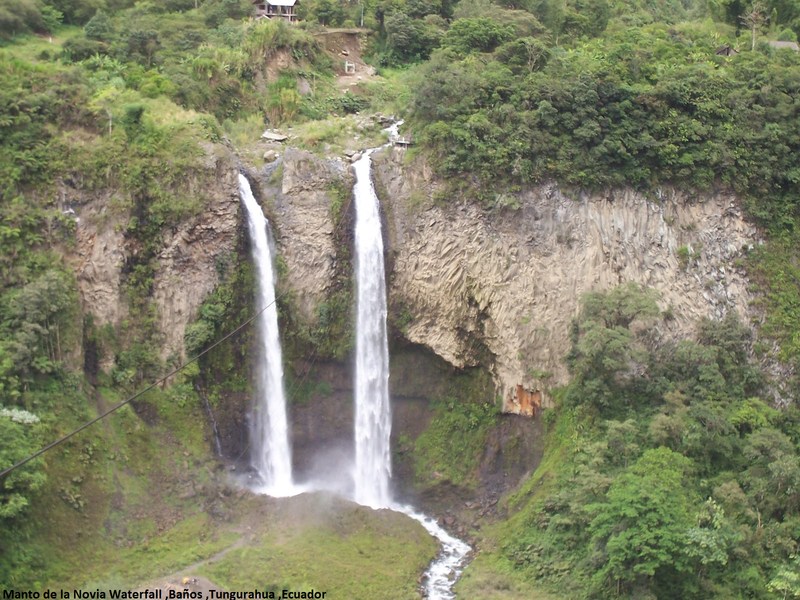 The road from Baños to Oriente or Amazonia is known as the waterfall route.You'll have a great time walking around. You can even go down to the drop in tarabita and cross the waterfall by a suspension bridge and then go swimming. Actually anything will be a nice experience or climb to the top and bottom by cable car (good view), and walk up and enjoy river also splendid water and vegetation and beautiful butterflies to hunt with your camera, great place to get back to nature. It is located 11 kilometers on the Baños - Puyo road. To get there, on the right hand side of the road, take a path and after crossing the suspension bridge of Chinchín, you reach the foot of the waterfall in an approximate 30-minute walk.